We are pleased to announce the Global 2013 STEMx Education Conference, the world’s first massively open online conference for educators which focuses on Science, Technology, Engineering, Math, and more. The conference will be held online, around the clock, over the course of three days, September 19 - 21, 2013, and will be free to attend! Our founding sponsor is HP, and core conference support also comes from the International Society for Technology in Education® (ISTE). 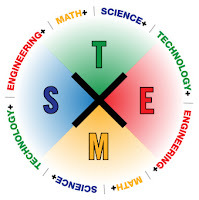 STEMxCon will be a highly inclusive and engaging event that will encourage primary, secondary, and tertiary (K-16) students and educators around the world to share and learn about innovative approaches to STEMx learning and teaching. Register at http://www.STEMxCon.com to be kept informed, and check out the conference information and menu links to the left and at the top of each page. The conference seeks to present ideas, examples, and projects related to STEM in a changing world. The Call for Proposals for the conference opens May 30th, 2013. Presenters can submit proposals for general sessions focused on one of the conference strands. While the final deadline for submissions is September 1, 2013, presenters will be notified of acceptance on a rolling basis starting June 15th, 2013. There is a motivation for early submission and acceptance, since once accepted presenters are able to schedule their own presentation times and the options become more limited as time goes on. As a conference that is focused on being participatory, we encourage new presenters as well as more experienced ones to submit to present. To sign up for the advisory board, please make sure you have joined the STEMxCon online network, and then join the advisory board group HERE. Whether you are a small school or a multi-national non-profit organization, we want to encourage you to become a conference partner. You must be non-commercial and primarily or substantively focused on STEMx activities to be approved. Once approved, your organization will be listed with a link, logo, and a short description; and you will be provided with a "spotlight" speaker session in the conference. Our goal for the conference is to have it be a milestone event, bringing together organizations and individuals from all over the world. We recognize that much (if not most!) of the outreach for this conference will come from schools and organizations who advertise the conference to their memberships, and we want to recognize and "reward" those who do this! There are no financial obligations for being a partner organization--all we ask is that you actively promote the conference to your membership and network, and encourage participation as well as presentations and submissions. To apply to be a conference partner organization, please make sure you have joined the STEMxCon online network, and then join the partner group HERE. There are opportunities for commercial sponsorship of STEMxCon, and both recognition and authentic appreciation for financial support will be given to those who choose to sponsor. Sponsorship levels and benefits can be discussed with Steve Hargadon directly at steve@hargadon.com or 916-283-7901. STEMxCon's founding sponsor is HP. As one of the world’s largest technology companies with operations in more than 170 countries, HP is helping to solve environmental and social challenges by uniting the power of people and technology. The HP Sustainability & Social Innovation team focuses on improving lives and businesses every day by focusing on the environment, health, education, and community. By bringing together the expertise of their more than 300,000 HP employees in collaboration with our partners, HP makes technology work for people in powerful ways that create a positive impact on the world. The International Society for Technology in Education (ISTE®) is also a core conference supporter, and is the premier membership association for educators and education leaders engaged in improving learning and teaching by advancing the effective use of technology in PK–12 and teacher education. ISTE represents more than 100,000 education leaders and emerging leaders throughout the world and informs its members regarding educational issues of national and global scope. We are looking forward to this fun event, and to your participation! For further updates, please join the STEMxCon network and follow the conference hashtag #stemxcon, the STEMxCon Twitter account, and the STEMxCon Facebook page.